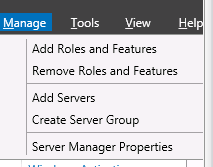 From the Server Manager menu, select “Add Roles and Features” from the “Manage” drop-down. Select the “Role-based or feature-based installation” option. From the list of servers presented, select the appropriate server. 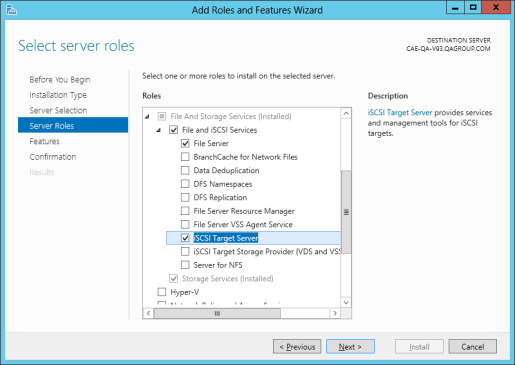 On the “Select Server Roles” screen under “Server Roles”, navigate to and select “File and iSCSI Services” / “iSCSI Target Server”. Note: “File and iSCSI Services” is in the tree hierarchy under “File and Storage Services” which is typically shaded and difficult to find. Click “Next” twice to get to the “Install” button to be able to install the role. The feature will install and the progress will be shown. Upon completion, the message “Installation succeeded” will be displayed. Repeat these steps for all servers in the cluster.